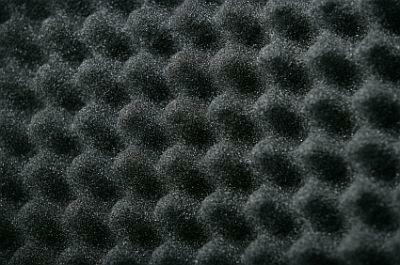 There are a lot of reasons to learn how to perform your own conversion van soundproofing. Whether you're looking to stop the rattling of your back panels or you want improve the performance of your vehicle sound system, soundproofing your conversion van will do the trick. The engine noise is loud for people sitting in the cab. The sound of the wheels against the pavement (road noise) is intolerable. The panel walls of the rear section of the conversion van rattle whenever you hit any little bump in the road. The sound system in the van has a slight "echo" in the rear of the vehicle because the sound waves bounce across the bare walls. Whatever your reason for wanting to soundproof your conversion van, the process is not overly complicated if you have the right tools and take your time. Engine blanket - This cuts down on engine noise. To insulate the engine compartment or trunk, choose foam or matting that's fairly thin but dense. Interior wheel wells and floors - Insulating the interior floor with rubberized matting (similar to engine compartment insulating material) deals with road noise. Doors and wall panels - Soundproofing these areas stops panel rattling and dramatically reduces transmission of sound from outside or inside the vehicle. In these areas, it's best to use padding that comes in multiple layers of compressed cotton. When you decide which area of your van requires soundproofing, gather together the required materials and tools, set aside a weekend and get started on your project! Usually, the only tools you'll need are a few good cutting tools, like utility knives and heavy duty scissors. If the padding is not self-adhesive, you may also need to purchase adhesive for metal. Work on soundproofing your van one area at a time. Carefully remove any external covering if necessary. Usually, van panels are bare metal, so working in such an area will be fairly simple. Wash the area that you'll be soundproofing with an all-purpose cleanser to remove any dirt or dust attached to the surface. Measure the area you're working on, and divide it into sections so that you can apply evenly sized strips of insulating material. Apply adhesive to both the clean surface you're insulating, and the side of the insulating material that you'll be laying against the surface. Carefully place the insulating material against the surface. Reposition quickly if required in order to make it attached in straight lines. Leave the area untouched for the amount of time that the adhesive manufacturer recommends for drying. The entire job will involve attaching the soundproofing material to large sections of your vehicle. Remember to attach the material in strips just like you would insulate the wall of a house. Before you know it, you'll have your entire van insulated. Once you do, you'll enjoy a much more enjoyable and relaxing ride.